Before starting a large project (such as a PhD) it is crucial to have some form version control system for the text and files you are going to produce. 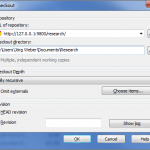 I start a small series of blog posts about how I (hope to) achieve this for LaTeX and Stata .do files using the free version control system Subversion (SVN). One of the main advantages of Microsoft Word is its brilliant system to track changes and make comments, a thing that LaTeX lacks, so it is always a bit difficult to collaborate and be aware of changes. I have only recently switched to LaTeX because of its ability to integrate result tables from Stata automatically (in my opinion the only big advantage of LaTeX. You can do amazing things in Word as well, but more about that in some future posts), so I started looking into version controlling for LaTeX projects. I was always hesitant to try out Subversion because it requires setting up an Apache server, something I had horrible experiences with in the past under Windows, but I have discovered uberSVN by WANdisco, a free and preconfigured Subversion server system – all you have to do is install it like a normal Windows programme. The whole process of setting up an SVN should now take less than 20 minutes (if you are slow). If you are unsure what Subversion actually is and does, I recommend a look into the LaTeX Wiki. In a nutshell, it allows you to keep track, compare, revise and merge different versions of the same file. It is absolutely crucial if you work on the same project with several authors, but even when you are working alone it is extremely useful. Imagine your supervisor tells you to delete one paragraph. You promptly do so, but the next day (s)he wants it back. You have probably saved the updated document under a new filename, or haven’t, but this system of version control get’s cumbersome after a while, even for small projects. This is where Subversion jumps in. Every time you do a (major) change, you ‘check-in’ in the revised version and SVN stores it under a new revision. If you want to go back, you simply ‘check-out’ the older revision. I will post more about the workflow in one of the next post, but now let’s have a little ‘Installing Subversion for Dummies’ tutorial. One last piece of advice: Subversion is not a backup tool. If you lose the repository (the database where your files are stored), you lose everything except your local files. For Backup purposes you could use something like Crashplan or Dropbox (that’s what I do). Download uberSVN. That is the Subversion server. While you are at it, make sure to download the Subversion 1.7.x Client because we will be using the 1.7 version of Subversion which cannot be accessed with older clients. Now open the control panel in your browser, set up a password etc. Once you are asked where to store the SVN files, choose something like C:\SVN. 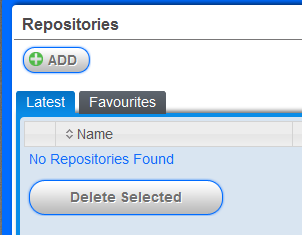 This folder contains the repository, so it should be nowhere near your locally stored project files. Switch to Subversion 1.7 under Administration > SVN Switch. Now install TortoiseSVN (the link is provided on the dashboard, or download it here). That’s the interface that allows you to manage your files, rather then doing it with a command-line tool. A restart might be required to see the overlays that indicate the file status in Windows Explorer. Now we are going to set up the repository, i.e. the database to store your data. If you have existing data that you want to check-in, i.e. a project in working progress, make sure to follow these steps closely. Most importantly: make a backup of your project files! 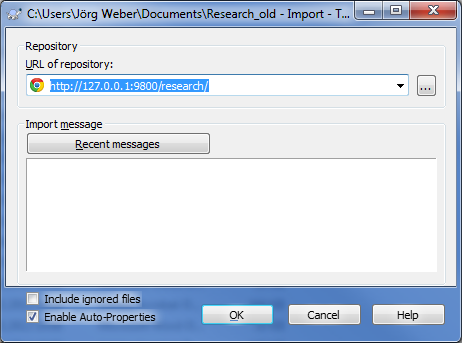 Set up the repository in uberSVN > Repositories > Add. Don’t change anything on the import or permission screens, just click save. The server will then restart and the repository is set up. Switch to Windows Explorer and go to the folder where your original data is stored (i.e. your research/project folder). Right-click on it and select TortoiseSVN > Import. This copies the whole folder into the repository. Enter the URL of your repository (e.g. http://127.0.0.1:9800/research). If you want to make sure that everything is copied click on ‘include ignored files’, as by default Tortoise ignores certain (often useless) file-types. After importing you can delete the folder (again, make a backup). This whole process is necessary so that SVN knows which folders to watch. Therefore go to the folder where you want your project files now to be stored. 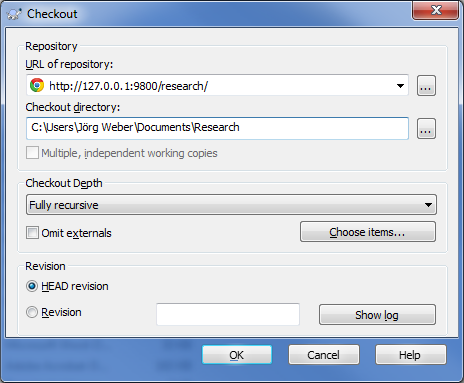 Right-click on empty space in the Explorer and select SVN Checkout. This copies the content of the repository, i.e. what you just imported, to the new location on your hard-drive. That’s it! Now Subversion is set up and your project files are being watched. Note that you always have to manually check-in any changes you made to the files, otherwise they are not updated in the repository. If you have have changed a file or folder, this is indicated by a red exclamation mark overlay in the Explorer. To update, just right-click on the item and select SVN Commit. A version control system is only as good as it’s weakest link: the user. So I will be posting more about the workflow with LaTeX and Stata soon. 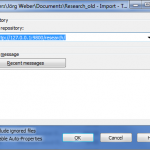 This entry was posted in LaTeX, Research and tagged LaTeX, Subversion, SVN, Version control by Jörg Weber. Bookmark the permalink.